↑ 1.0 1.1 Griffiths, David J. (2013). Introduction to Electrodynamics (4th ed.). Boston, Mas. : Pearson. ↑ James Clerk Maxwell. (1891). A Treatise on Electricity and Magnetism, Dover Publications Inc.
↑ Roller, Duane; Roller, D.H.D. (1954). 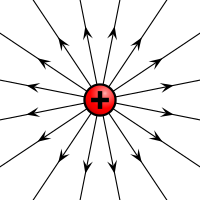 The development of the concept of electric charge: Electricity from the Greeks to Coulomb. Cambridge, MA: Harvard University Press. ↑ Roald K. Wangsness (1986). Electromagnetic Fields (2nd Ed.). Wiley. ↑ Serway, Raymond A.; Jewett, John W. (2004). Physics for Scientists and Engineers (6th ed.). Brooks/Cole. ↑ Jefimenko, O.D. (1999). "Relativistic invariance of electric charge" (PDF). Zeitschrift für Naturforschung A. 54 (10–11): 637–644. ↑ Singal, A.K. (1992). "On the charge invariance and relativistic electric fields from a steady conduction current". Physics Letters A. 162 (2): 91–95.